I envy those who have naturally long lashes. For someone who has lashes that are short, sparse, and straight, mascara can only do so much. Don't get me wrong, I flaunt what I got (that includes my short lashes). But since false lashes exist, it's fun seeing what it's like if I have naturally long, full, and voluminous lashes. 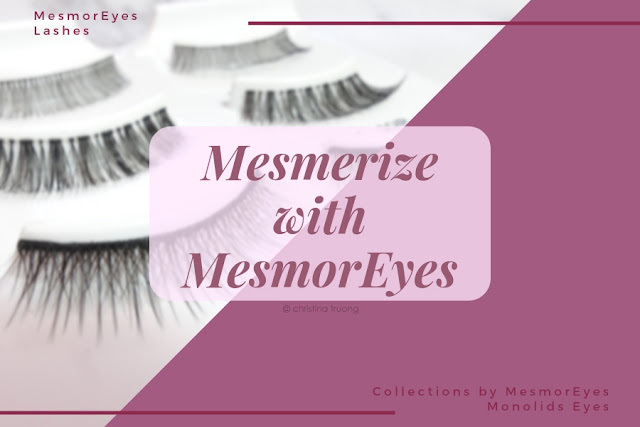 MesmorEyes Lashes are premium quality lashes that are hand knotted and feathered for the most natural appearance. They are made with a lightweight band, which makes them light and comfortable to wear and easy to remove. These lashes can help create fuller, more dramatic eyes or that Hollywood glamour look. Although the lashes sound great, one issue I sometimes have with false lashes are that they are not quite a "one size fits all" - what looks good on someone might not be the same for another. Collections by MesmorEyes comes with 3 sets of lash styles (Day, Play, and Night) that are ideal for your unique eye shape. Whether it's Almond, Monolid, Round, or Hooded Eyes, MesmorEyes Lashes did all the curating, so there's no need to sit around figuring out which false lash suits you. The MesmorEyes Eyelash Adhesive offers superior adhesion, dries quick and clear for invisible results. The lashes stayed on all day, and it even survive through strong winds - I was certain that the lashes would at least partially fall off but it didn't! As for the lashes themselves, these MesmorEyes Lashes almost look and feel like Mink lashes! They are lightweight, comfortable, and don't weigh down on my eyes. All three styles, I feel, are subtle enough that they can be worn any time of day. The "Day" lashes (MesmorEyes 217) are a simple style lash, they provide that length and volume that I envy. They almost look as if I naturally have long lashes and I just simply curled them with a lash curler. The "Play" lashes (MesmorEyes 223) are similar to the "Day" lashes, the only difference is that they are a bit fuller and the lashes fan out starting at the inner corner and gradually lengthens at the end. The "Night" lashes (MesmorEyes Special Edition) are probably my most favourite out of the three. They are different compared to "Day" and "Play". The band is a bit thicker and the lashes criss-cross, providing the lashes to fan out and give the eyes that sultry eye look. Overall, I LOVE these MesmorEyes Lashes and at the price of under $15 (which is about $5 a pair), I highly recommend picking up these lashes and giving them a try! Whether you're interested in trying false lashes for the first time or all-time wearer, these comfortable and lightweight lashes are easy to wear and look natural while wearing them. What are your thoughts on MesmorEyes Lashes? Are you an avid eyelash wearer? Do you have a favourite style of lashes? Disclaimer: Products featured were sent by ChickAdvisor for review purposes. Views expressed are honest and of my own. Amazon links are affiliate links. Bright All Day, Right Away!